We need the books that affect us like a disaster, that grieve us deeply, like the death of someone we loved more than ourselves, like being banished into forests far from everyone. Litro’s Poland issue got me thinking about the woods. You see, there’s a forest in Poland which is arguably the most important in Europe. Puszcza Białowieska. The largest surviving remnant of the vast primeval forest that would once have sheltered all of Europe under a single green roof. They say that the Białowieża Forest is where we all once were. Once upon a time, gnarled and ancient trees such as those now confined there grew from the steppes to the Atlantic. Men and women painted in woad tracked elk and wolf through thicket and glade. The plants were the people’s gods and their sustenance, their shelter and their fuel and their secrets. They shared them with the wisent, the European wood bison, the last herd of whom still graze in the darkest depths of the Białowieża. We live in a romantic era. It might not seem that way, when we wake after too many whiskies in a rain-drenched concrete jungle, but we do, at least as far as our woodlands are concerned. When we talk about nature we talk like 19th-century poets. We cast it as beautiful and more honest. We are nature-lovers. We retreat to nature, set nature to symphonies on our television sets, frame nature on our walls. Last year, when the British Government tried to privatize the country’s forests, there was uproar, even from those who visit forests rarely. We like, I think, to know the woods are there for us. They’re a safe haven. They’re like an elderly and wise grandmother we might visit when urban life gets tough. She gives us a sense of permanence, a sense that our lives are rooted in older things. This is, of course, a deeply selective love. Real nature is full of disease and poison and predators, but we don’t hang pictures of slime mould over the mantelpiece. British forests in particular have been carefully managed to keep the unseemly at bay. If it threatened to kill us we killed it back, long ago. Our woods are gardens now, which we can retreat to for pleasure, but which have little of the true wild about them. But Białowieża? It is still as wild as it was at the dawn of time. And the forest looms black like a mansion gigantic. It was a heiliger Hain, a “sacred grove.” Not a leaf was to suffer hurt. Fur and feathers were to be strictly protected. For the elk and bison were now his elk and bison – German elk and bison. The original Hansel and Gretel tale resonates for the same reasons that Louise Murphy’s novel does: vulnerable children, at the mercy of both nature and amoral adults, make for compelling characters. Although we wouldn’t much like to, we can all imagine what would probably happen to children lost in the forests of the real world (The True Story of Hansel and Gretel, while carefully researched and full of much truth, is not actually a true story). In fiction, at least, children left in the forest tend to survive. What’s interesting is who saves them. It’s rarely the adults who do so, but nature itself. Even in a folk tale as rarely bleak as Babes In The Wood, in which the two wandering infants do perish, nature affords them some final dignity when a robin buries them under leaves. Children are saved by the forest all of the time. From the Narnia books to Where the Wild Things Are, the forest serves as a place of liberation from the dangers of the adult world. It might very well be terrifying, it might flash fangs at them along the way, but among the trees children learn their own power to withstand. 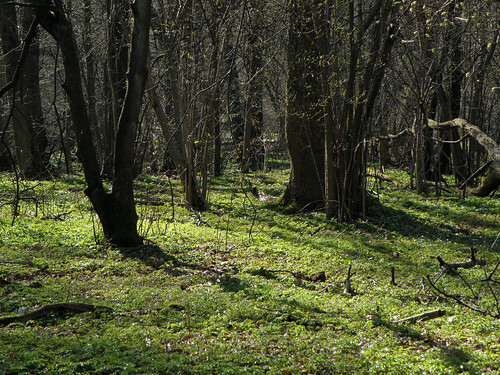 It is good to know that the Białowieża Forest sits under its own green shadows on the edge of Europe, despite its tortured history. It is good to know that somewhere beneath its canopy the last of the European bison chew the cud, and it is good to think of them as the hoofed populace of some wilder time, still plodding through the tangled primeval forest. Yet even in this precious relic of a place, history impedes a good story. Today’s bison are all descendents of zoo-bred animals. The last wild European wood bison was eaten in 1919. Praiseworthy game-keepers, conservationists and forest-managers have worked wonders to rebuild a single herd, bringing the animals in to feed for the winter, monitoring their numbers, trying to teach them how to live independently in the woods. To look too closely at nature is to spoil the fictions we create about it. We know full well that the domain of human things isn’t, whatever else it may be, innocent, but to romanticize nature is to give the world its innocence back. That is sometimes more valuable than telling the truth. In stories, children get lost in primeval forests and are rescued by wolves and fauns and wild things because we adults need to believe such places remain with us. Then we may have hope that we, too, might wander under their branches some day.